One of my favourite things about the beginning of each year is seeing the stars all dressed up for film & music award shows. I love seeing fashion-forward statements and beautiful gowns, and at the Oscars, the stars go all out showing off high-end pieces. What’s not to love?! In my opinion, Jennifer Lawrence stole the show on the red carpet wearing this luxe lace Dior Couture gown. She rocked the sheer frock with elegance. I think the pairing of the sleek lob and the layered gown might be my favourite look she has worn to any of the Oscars so far. If I were a modern-day Princess Ariel and had to choose one gown to impress Prince Eric then this would be it. Saoirse Ronan pulled off an emerald sequin gown by Calvin Klein Collection effortlessly. Margot Robbie looked old-school Hollywood glamour in a gold sequin dress by Tom Ford. Whilst Lady Gaga rocked a futuristic capelet jumpsuit capelet by Brandon Maxwell teamed with very Marilyn Monroe glamour curls. I thought Daisy Ridley looked so elegant and classy in a silver encrusted gem Chanel Couture gown. Finally, Priyanka Chopra looked radiant in a white lace dress by one of my favourite dress designers Zuhair Murad. I can’t leave out my favourites from the after-party now, can I? Queen Gwen Stefani looked gorgeous as always in a Yanina Couture gown that resembled rose petals. Elizabeth Banks looked very ladylike wearing this fantastic Ralph & Russo caped gown. Taylor Swift looked stunning in this sleek Alexandre Vauthier dress with a plunging neckline, and high slit alongside her bestie Lorde in a Monique Lhuillier encrusted gem top & gorgeous tulle skirt. Finally, a very special shout-out to Leonardo DiCaprio who looked handsome wearing his Tuxedo by Giorgio Armani. 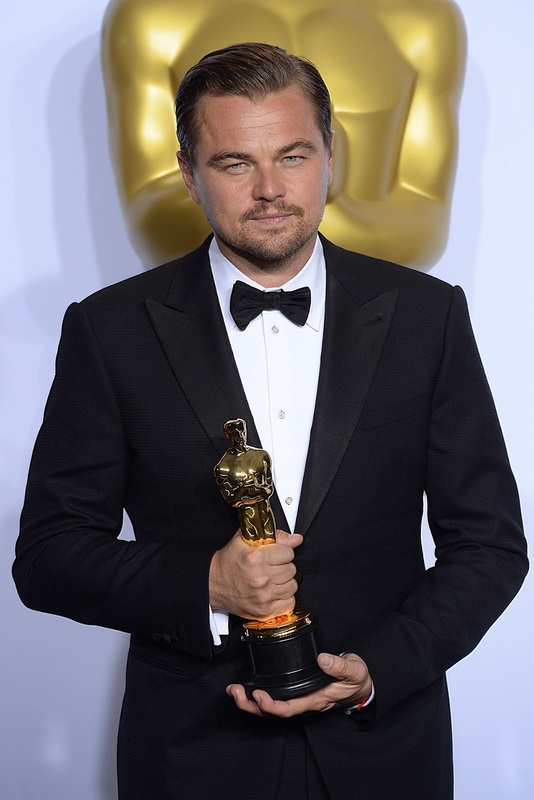 I’m so pleased for him winning his first Oscar and dedicating his speech to climate change (what a guy!). Who did you think was best-dressed at the Oscars?